Find out if hiring a music therapist is right for you, and get your chance to participate today for free. 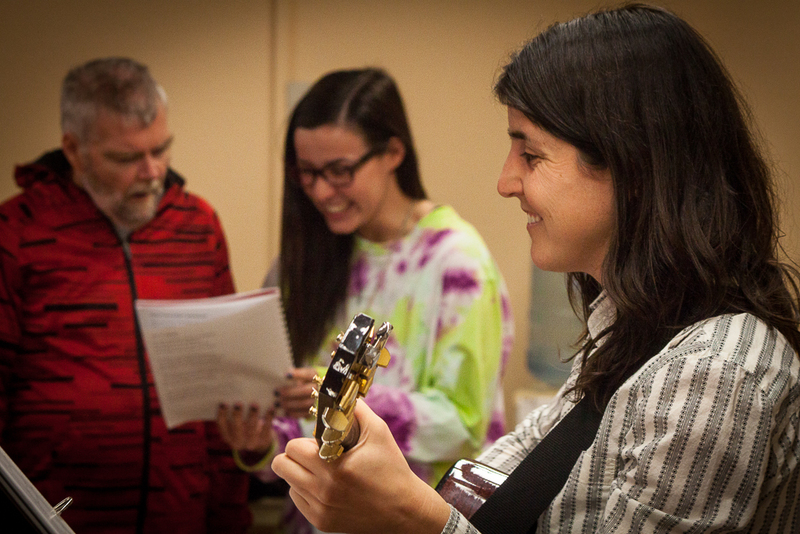 BUT FIRST, here’s the story of how I chose to become a music therapist. First, I met a music therapist. I was on a bus in Pine Ridge Indian Reservation on our way to a pow wow with a group of volunteers for an organization called Re-Member. How I got there is another story. Bob told me he was a full time music therapist and it felt like someone had just revealed a secret I’d never known — there is a profession that uses music to help people, and there are people who do this as their normal job, and I was sitting next to one of them on the bus. Life Changing Moment. A few weeks later, I visited my best friend in Michigan, and Bob allowed me to shadow him for half a day at Mott Children’s Hospital, where he worked. It was shocking at first, to see kids hooked up to machines that kept them alive in the ICU, but maybe because of the music Bob played, within a few minutes of being in each room, I warmed up. I still remember when one child on a ventilator who seemed completely unresponsive to me silently mouthed the words “thank you” before we left the room. I just about cried. Bob let me sing my songs to a young woman receiving chemotherapy and her twin sister and dad. As I sang, it felt like the hospital room we were in faded to the background and we were just people again, enjoying a moment, and sharing an experience together. It wasn’t easy. And I don’t regret a second of it. I don’t regret the hard work it took to become a music therapist because now I get to work with people, just like you, who want to see how music can change their lives. 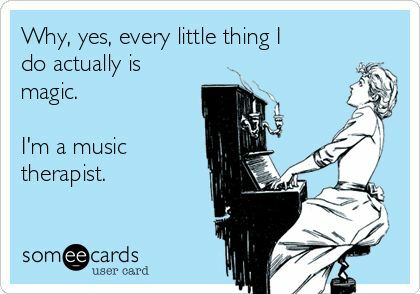 Who is a music therapist for? The clinical answer to this question includes a long list of diagnoses—people with autism, down syndrome, Parkinson’s, dementia, Alzheimers, stroke, depression, anxiety, disability, adhd, ataxia, apraxia, and many many more. Music therapy is a clinical practice, and it is absolutely for you (or your loved one) if you identify with one or more of the above diagnoses. What if you don’t have a diagnosis? Or don’t like identifying yourself as a disability or illness? I’m with you. And I want to go a little deeper with this question. It’s part of why I started my own online music therapy business, to serve people outside of the traditional scope, or who might not have access to music therapy in the clinical setting. The clinical approach matches our current healthcare model where people must be diagnosed in order to receive specialized care. I’ve talked to concerned mothers of kids who exhibit signs of autism, convincing them to see if their child is diagnosable only because it will give them access to so many extra services if they get diagnosed. It’s simply the way our system works…for now. Our current healthcare system is built upon finding what’s wrong and how to fix it, rather than what’s present and how to be with it. Music therapy is for anyone who wants to get back in touch with their blueprint of health* using a tool that’s been a consistent part of human evolution for tens of thousands of years and is backed by current research and neuroscience — MUSIC. *“Blueprint of health” is a term coined by Brigit Viksnins. You can use music to improve your life now. But the only way to do music therapy is with a music therapist (trust me, there are laws formed in many states already making it illegal to call something music therapy if it’s not done by a board certified music therapist). Music therapists are trained professionals in how to use music to assess and address people’s emotional, physical, spiritual, and/or social needs. Because I’m a nationally board certified music therapist and nuerologic music therapy fellow, I can work with you, whether you have a diagnosis or not. In fact, I’d love to work with you. Want to get a feel for what I do as a music therapist? I’ve turned my favorite tried and true music therapy activities into an experiential online video music therapy course. It’s called Tapping Into Your Creative Flow. In six short videos, I’ll guide you through various experiences as I would guide someone in one of my in-person music therapy sessions. Because I’m not there in person, I’ll keep it light and encourage you to only do what feels good. You’ll receive a live music guided relaxation. 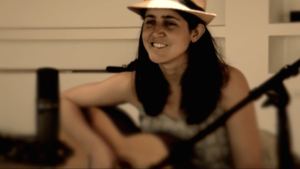 You’ll have a chance to sing and play along with a familiar song. And you’ll tap into your creative flow by re-writing an existing popular song. The coolest part? You don’t have to have ANY MUSICAL EXPERIENCE. And if you have lots of musical experience? You will still benefit greatly because you’ll see how something you already use and love (music) can help you be present and increase your creative capacity. Everyone is a creative being, but sometimes we forget. We doubt ourselves. We turn down the opportunities we have to be creative because we’re scared we’ll be bad at it. We might wonder where to even begin. This course is a great place to start and it’s free today. So sign up and see how it goes! Tapping Into Your Creative Flow is packed with value, and I’m offering it to you for FREE, just for choosing to be part of this online creative community. So you don’t even need to spend a dollar, or even another minute of your time. All you need to do is sign up for my mailing list, check your email, and you can have your own personal music therapy video session online right now (or in 2 hours, or whenever you want). Afterwards you will know, from experience, how I use music to facilitate positive change in people’s lives as a music therapist. All from the comfortable, zero-pressure environment of your home. Welcome to the creative community! Check your email for your course and add jodi@jodiclaren.com to your contacts. My name is Jodi McLaren. I’m here to help you tap into your creative energy through songwriting and music therapy. Sign up today, and get Tapping Into Your Creative Flow online course for FREE (a $49 value)! The first 10 people to pre-order Free Your Song online songwriting course will get two hours of 1-on-1 calls with me, no extra charge ($300 value). Want a way in to play music that’s easy, fun, and cheap? I’ve got everything you need to know to start playing the ukulele this week! Want to experience music therapy right now for free? In my online music therapy course, Tapping Into Your Creative Flow, I’ll invite and guide you to open up to your creativity, get present, generate ideas on the page, and rewrite a popular existing song. Get your creative juices flowing and have some fun with me!